caramia made: Spring Wardrobe Challenge Underway! Ahhh springtime! Days are getting longer, people are walking around town in shorts paired with a puffy vest, dust is flying up off the road from vehicles, and I'm getting a sudden craving for pastel-hued clothing! I made this office-appropriate dress based on the 9 to 5 dress from the Built By Wendy Dresses book (so awesome). The book suggested making this dress out of an orange linen, but I ended up using a cheap pastel orange twill that I bought on clearance for $3/m. I think the twill works alright, but in hindsight I should have not bothered with interfacing on the sleeve facings... it's a bit too stiff for my liking. I pretty much followed the book exactly, except that I added 2 darts in the back to reduce some of the volume on either side of the zipper. This is also the first time I've used an actual zipper foot to install an invisible zipper and it looks frigging fantastic! The book also suggested making a belt out of the same fabric, but for now I've just styled it with a dark brown skinny belt that I already had. I also ended up making belt loops to keep the belt from floating randomly around my torso. I'm still not 100% sure about the colour. I really like orange a lot, but I think this shade might wash me out. Luckily I get pretty dark in the summer (hooray for Spanish bloodlines!) so I think it will look better then. Sorry the pics are kind of blurry... I guess the lighting wasn't too great today (too bright out). 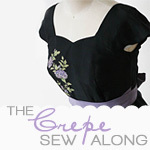 I also finally got some photos of my finished Crepe dress... It's been done for a few weeks - I swear! Hola Marisela! I am pleased to meet you! Hi there! you look gorgeous in this dress, what pattern did you use to make it? I'd love to make it for my daughter. See you!! Which dress were you interested in? The orange dress is from the Built By Wendy Dresses sewing book (the sheath pattern and I used the 9 to 5 dress project). The white dress is from the Crepe pattern by Colette Patterns. Good luck, and I can't wait to see what you come up with!